This ability to effectively process sounds tracks with both language and reading ability and also is key to music creation. To understand language, a child has to neurally respond to letter sounds at a lightning-fast speed. 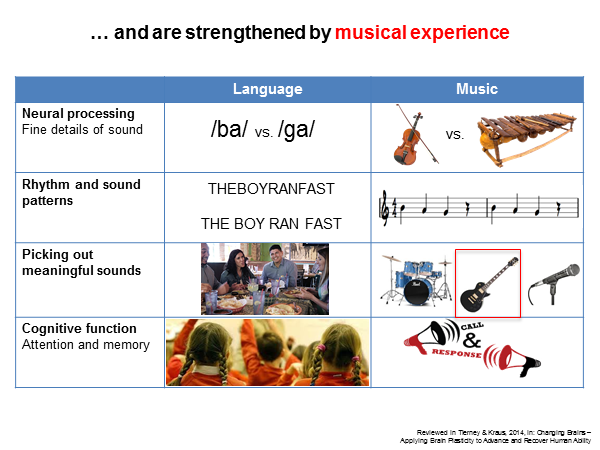 Children who struggle with this ability will have difficulty hearing the difference between similar sounds like /ba/ and /ga/. And that is just one of a number of auditory skills required for children to contend with the complexities of language. When we make music, we need to be able to distinguish between notes rather than letters and use them to create chords, play measures and full songs similar to the way we develop words, sentences, and paragraphs. We also need to follow rhythm patterns and pick out the sound of our instrument or voice from the other sounds around us. Does music education improve language acquisition, reading ability and/or overall academic ability? What about the nature-nurture debate? Are some musical children better students because their brains were stronger to begin with? Maybe their gifted brains convinced them to pick music in the first place. Does it matter if a child pursues music versus a non-sound activity? Perhaps a rigorous commitment to any activity yields similar improvement. We now have the science to answer these questions and others. Our research is showing that music education has a profound effect on children’s academic ability – and that includes children from a variety of socioeconomic backgrounds. Our lab places electrodes on people’s scalps to track how their brains process sounds. When we hear something, electrical pulses are created that are similar to sound waves. Our equipment allows us to read these pulses and record them. 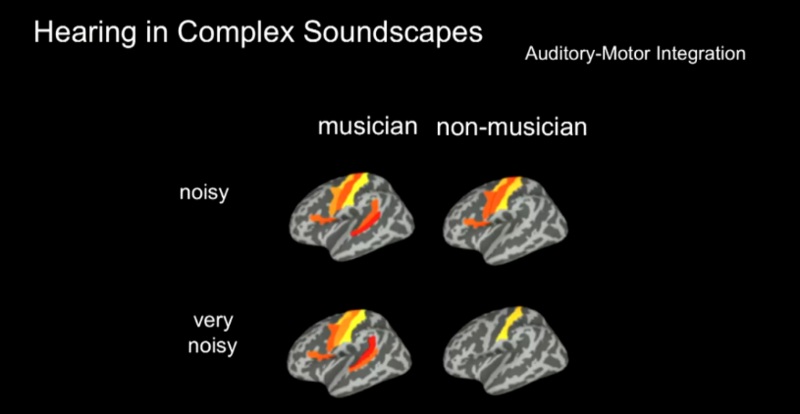 This enables us to see how accurately and precisely an individual is processing sound. For people who have trouble, volume is usually not the issue. 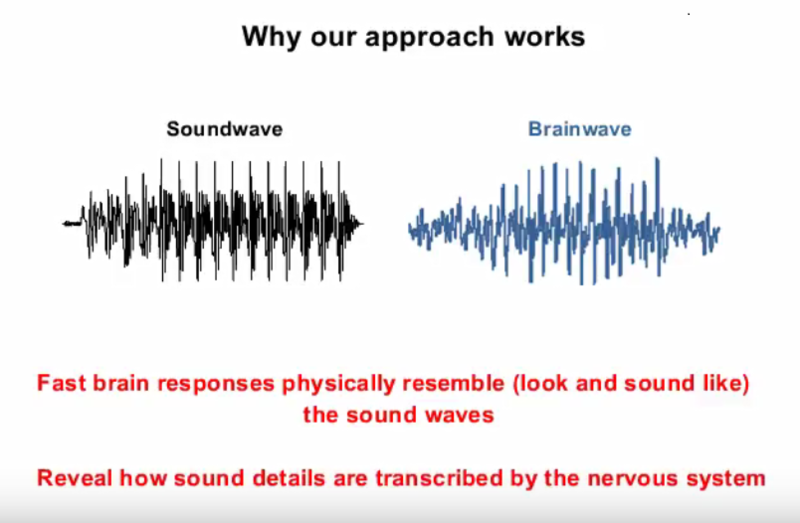 Our auditory processing is more like a stereo mixer where, if certain aspects of sound are not mixed well, it will affect our ability to understand what is heard. This can include the ability to track pitch, harmonics, consonant timing, and fundamental frequency. Our brains also create a certain amount of neural noise. If that noise is high, this can cause external sounds to seem distorted or muffled. We also have found consistency issues with certain people in that they may hear the same sound different ways when the sound is repeated. We call this jitter. The stronger the auditory processing, the more consistency we expect to see and the less jitter a person’s brain will experience. We have found that children who struggle with language acquisition, reading ability, and general learning often have issues related to consistency, neural noise, and other auditory processing skills. This is particularly true among children in lower socioeconomic groups, who are often not exposed to as much vocabulary in their households as other children. District officials tested the students after three years, and they found a dramatic increase in test scores – a 61% increase in reading and 54% increase in math proficiency among Harmony students, compared with non-Harmony same-school peers. We have conducted numerous studies with children and teens to see how music education affects their auditory processing skills and, in turn, their academic performance. One group of kids we studied extensively were students taking part in a program called the Harmony Project in southern California. This program was started by Dr. Margaret Martin in 2001 to provide mentoring through music to students from low-income households. The program engages students in classes and rehearsals with professional and peer mentors two to five days a week for at least four hours of music making per week. Once the children are admitted to the program, Harmony Project commits to providing a spot to them throughout their childhood until they graduate from high school. The average student spends seven years in the program, which begins with a musicianship class followed by group lessons and ensemble participation. These group lessons have 10–15 students playing the same instrument. Dr. Martin says that over time she noticed academic accomplishments among students in the program that she could not explain with her social science background. Kids started self-reporting strong improvements in their grades, and more than 90% of the students graduating from the program were going to college, with many picking STEM majors. They’ve had two Fulbright Scholars and a Gates Scholar. This was out of step with students in the rest of the community. Dr. Martin reached out to the National Institutes of Health, who connected her with my Auditory Neuroscience Laboratory lab at Northwestern University. We devised a study that focused on some of the students on the long Harmony Project wait list. We selected 80 second graders on that list. We tested them before they began the program and again after one and two years. Children participating in Harmony Project were compared with those in a control group who were not given a spot during the first year of study time, but were promised a spot later. The results were clear – music education dramatically improved auditory processing skills after two years in the program. The time factor and the need for hands-on involvement were important. It takes time to fix a brain, and it cannot be done just by listening to music. Active involvement by playing an instrument or singing is crucial, and the benefits were only apparent after two years. The results were strong enough that Dr. Martin approached school districts about adding Harmony Project as an after-school program. The district in Long Beach, California used Title 1 and 21st Century Community Learning Center funds to launch Harmony Project as part of its Safe Schools Initiative in four Title 1 elementary schools in high-crime neighborhoods. Ninety-three percent of the students qualified for federal meal subsidies due to low family income, and half were English language learners. District officials tested the students after three years, and they found a dramatic increase in test scores – a 61% increase in reading and 54% increase in math proficiency among Harmony students, compared with non-Harmony same-school peers. In another study, we looked at high school students from lower socioeconomic groups in Chicago, Illinois. The students in the study were involved in either music training or a Junior Reserve Officer Training Corps (JROTC) program. Our initial tests showed these students had linguistic deprivation. Again it took about two years to see gains; those auditory enhancements occurred only to students in musical training, but not to those in the JROTC program. This indicates that musical training is a key to improvement, and while other activities are certainly worthwhile, the benefits are not the same. We have also completed studies on students in higher economic groups, including teens who attended an elite high school in Chicago. These studies have consistently found similar benefits of music education. And the good news is the benefit lasts. Stronger auditory skills continue into adulthood, and older adult musicians generally have stronger auditory skills than non-musicians, including the ability to hear amid noise and to remember auditory information. Students cannot follow verbal instruction in a classroom if they have trouble filtering out unimportant auditory sounds and focusing on the teacher’s voice. This is a difficult task for many students. To test this skill, we give students mixed audio tracks that combine a spoken sentence with other noise and then check their ability to understand the sentence. We have found students’ comprehension shows strong improvement after two years of hands-on music training, and this improvement continues into adulthood. Students also benefit if their auditory reaction time is fast and if they can recall auditory information. A student’s attention will be lost if they are still concentrating on the first sentence of a teacher’s explanation and miss the second or third sentences. It’s also a problem if they can’t remember what is said to them. In most students, music training provides excellent improvement in these areas. The ability to properly analyze the sounds of speech is critical to language development and reading skills. Students need to be able to distinguish the differences in phoneme sounds to understand the spoken word, replicate it, and use that knowledge to read. Music training helps the brain focus and accurately process these fine details. One of our newer and exciting areas of study focuses on rhythm. Educators reported at a school board meeting in Riverside, California that when they asked 5th graders to mimic a rhythm by banging on buckets, the students struggled with this task. It turned out these students all had difficulty with reading. 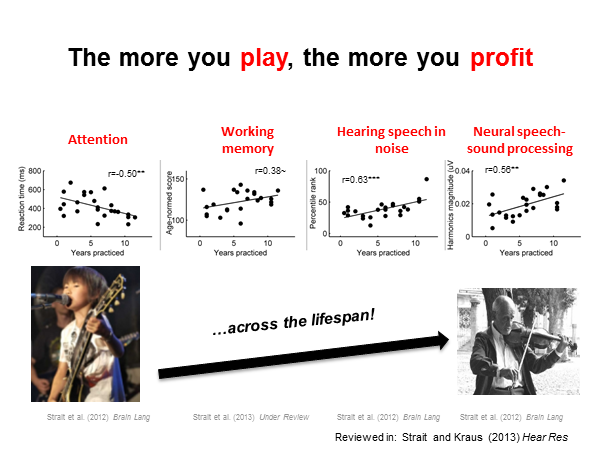 This showed one important finding we have uncovered – rhythm skills are predictive. A young child who has troubling matching rhythm will likely have difficulty learning how to read. 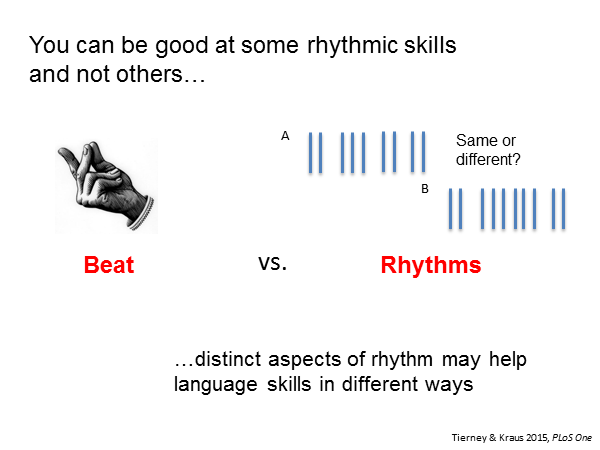 Teaching these rhythm skills can help fix the problems in the child’s brain so he or she can be successful. The brain makes its own rhythms through electrical pulses that can be slow or fast. It will manufacture beats in between auditory beats to help establish rhythm in the same way eighth-note backbeats may be added to drum rhythms. These abilities help the brain follow the patterns of speech and also enable us to know if music is on or off the rhythm. The auditory and motor systems in the brain are also closely integrated. Musicians will activate the motor sections of the brain if they just imagine playing an instrument. When there is noise, musicians will activate the motor cortex to try to hear speech. The noisier the environment, the more a musician will utilize this function to try to hear what they want to hear. Kids with strong rhythm skills will not only be better able to hear in noise, but they will also have less jitter in their brains. It will be easier for them to make sound-to-meaning connections. We have found that not all rhythm abilities are the same. Some people may be able to follow a pulse or beat but have trouble replicating rhythm patterns – and sometimes the reverse happens. It turns out the ability to replicate a beat is different than the ability to follow the duration of notes to copy patterns. 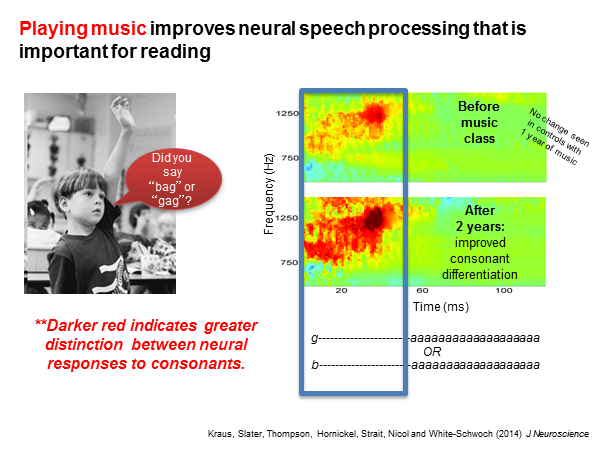 Both are important for language acquisition and reading – one is involved in fast processing and the other for tasks involving slower brain waves. The ability to follow patterns is particularly used when trying to hear in noise. In these scenarios, we listen by trying to following speech patterns, which is similar to following rhythm patterns. Medical experts, scientists, and educators are increasingly understanding the power of rhythm. Music therapists often use rhythm to teach students. Music rhythms are used to help with movement disorders and are being researched to help people with concussions. Psychiatrists like Dr. James Hudziak, who directs the Vermont Center for Children, Youth and Families at the University of Vermont, routinely prescribes music lessons to both children and adults to improve the functioning of their brains and their ability to learn. There are video games like Interactive Metronome that are designed to help improve rhythm skills. And Harmony Project has launched a national office to help school districts integrate Harmony Project programs after school hours for students in grades 2 – 12, and during school hours for pre-K, K and 1st graders (Harmony Boost). Our lab advocates for the important work that needs to be done in the classroom. 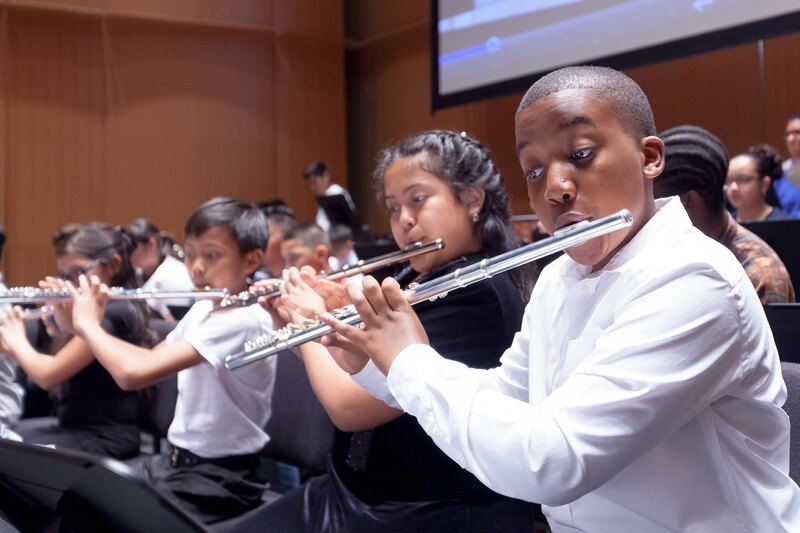 We welcome educators, parents, and administrators to download our advocacy brochure to promote music education in their schools across the United States. Please also visit our website for detailed information about our work. Please also view resources you can use to build your students’ rhythmic intelligence. Good information. Next Monday, the board is meeting with the music faculty to discuss our future, how to be more effective. We have gone from 8 music faculty in our district to 6, and still maintaining the same amount of programs. In fact, more have been added! I appreciate having this study/ article as we go into “battle” for the lack of a better word. Thanks again! We’re so glad you found the article to be helpful. Good luck at your board meeting!